Agave can be exceptional houseplants, depending on which one you buy. There are about 450 species of agave, including the famous century plant (which, for the record, does flower more often than once a century). As a desert plant, agave appreciates direct, abundant sunlight and light water. They are slow-growing, so even specimens that grow into large plants can be kept inside for a period of time before they outgrow the room. Agave plants are not very "people friendly" as their sap tends to be irritating and most of them feature truly intimidating spines on their leaves that make brushing against them a painful adventure. Water: In spring, water with warm water just as the soil begins to dry out. Don't let the soil become completely dry. In the winter and fall, when growth is suspended, water very lightly. Temperature: They prefer warm spring and summer temperatures (70 to 90 F) and cooler fall and winter temps (50 to 60 F). Agave americana. 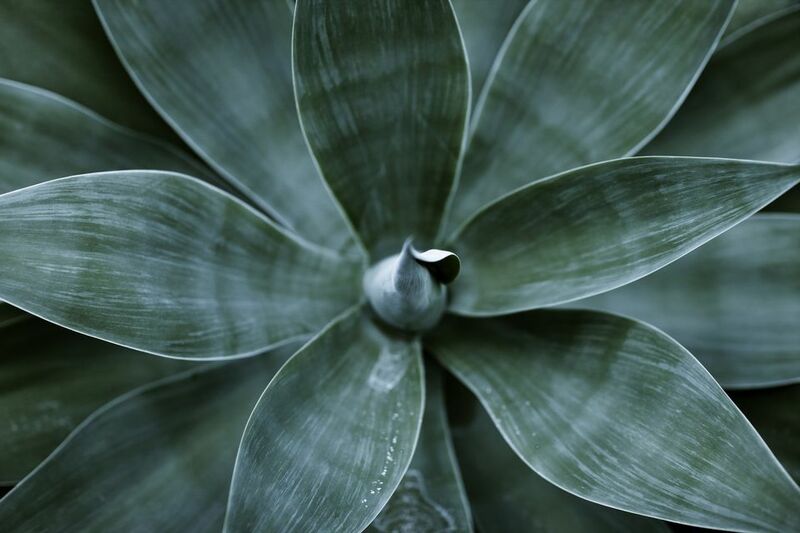 Sometimes called the century plant, it has beautiful bluish leaves with prominent, saw-tooth spines. A variegated variety, A. americana "Marginata" is available. These grow very large. Agave victoriae-reginae. This small agave has upright leaves tipped with black spines that only measure about 10 inches in height. This is a good indoor plant, but not as beautiful as the A. americana. Agave filifera. This rare plant has filaments extending from its leaf tips. Agave parryi. This is the blue agave with a rosette of thick, spined leaves. It loves lots of sun and won't tolerate cold temperatures. Agave plants are difficult to grow from seed, and indoor plants will rarely flower anyway. Instead, use offsets (pups that form at the base of the plants) that might be produced as the plant ages. Propagating indoor agave plants can be difficult because the houseplants may not produce offsets, and those that are produced and potted up frequently take a long time to begin growing. In most cases, it's better to simply buy a new plant or take your propagation efforts to the greenhouse or glasshouse. If you are potting up offsets, use a cactus soil and keep them in a place with strong light. Lightly water and give them plenty of time to form strong roots before repotting. In general, agave do not need to be repotted every year. Most of the species commonly found in cultivation grow very slowly and will take a long time to outgrow their pot. It's also best to handle your agave as little as possible since they do not like to be disturbed. When you do repot, refresh the spent soil with new potting mix and make sure the plant is firmly anchored in its pot. However, be careful not to pot the agave too deep as that will encourage stem rot during the growing season. When repotting, use a fast-draining cacti or succulent mix. Do not use a mix that will become soggy or hold water. Agave is not a difficult plant to grow. They're slow-growing and dramatic and will even thrive on a bit of neglect. If you're the type of person who likes to fuss with houseplants and water a lot, agave is probably not the plant for you. If, however, you're the type of person who likes to set it and forget it, and you have a sunny window, agave might the way to go. Be aware that some of the large varieties will eventually outgrow your room (unless you have a large greenhouse), and agave can be aggressive. They have irritating sap and sometimes very sharp thorns that can cause injuries to small children and even pets. Make sure not to knock the pot over.